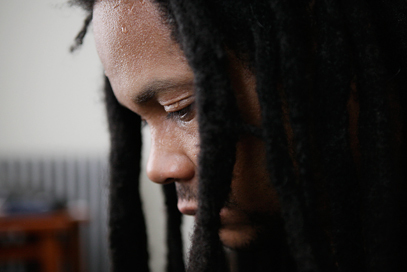 A month ago a DJ set by Hieroglyphic Being (aka Jamal Moss) set my world on fire. It was in Berlin, at the CTM festival, and I can't stop going over it in my head, rerunning the maths to find the multiplying factor. It was the first time I'd seen Moss DJ. It started at 3am, following an impeccable set of tessellated Techno by Kassem Mosse. But Jamal Moss's set was a different beast entirely: loose, sloppy and incredibly ugly in some parts, but always giddy, impatient and unpredictable. It ran through pitched up and pitched down tracks, and too many genres and styles to count on one hand. At one point it got into a call and response dialogue between New York disco and Krautrock. The mixing was at times slick, incredible (an air raid siren threaded through three tracks, sewing them together). In other places it was a dirty hack made with a blunt instrument. The constantly changing pace sent me nuts, for Hieroglyphic Being's disregard for the conventions of what constitutes 'good' DJing. In fact the performance capsized all the cliches that have built up around our idea of what makes a 'good' DJ set, ie that good mixing is a smooth segue between two tracks; that a set should move through styles in a gradual progression; that bpms shouldn't ramp up, plummet and shoot up again in the space of three minutes. Moss moved between sections full of sudden schizophrenic cuts from one track to another, and passages where he would let one groove run unmolested for almost ten minutes. Tracks were pulled after one chorus, played backwards, rewound. They were sped up to 170 bpm, then slammed up next to slow 80 bpm funk. I laughed my way through it, half the time shaking my head in disbelief, frowning, puzzled. Admittedly, it pushed my buttons, that New York disco stuff always does. But it was done with such confident swagger – with Moss resplendent in Battlefield Earth leather chic – that it worked. Some friends said they were finding it "very challenging". Why? Because what was expected (even given Hieroglyphic Being's diverse output) was not being adhered to. Descriptions of the mood in clubs and on dancefloors often resort to religious analogies, and this set required you to make a leap of faith, or find yourself at an impasse with regard to the sheer iconoclasm of it. CDJs are frowned on in some circles, but central to Moss's set was the way it foregrounded the sound of these tools – the fake scratching sound of the CDJs, the speed shifting (sometimes without pitch control), and brutal use of the fader. Whereas Kassem Mosse's set felt like a perfectly calibrated clockwork model (not conventional, but certainly neat and tidy), Hieroglyphic Being's was the boss-eyed Frankenstein's monster you fall in love with precisely for his scars and club foot.